As a member of a national brand of flooring, we are able to sell such high-quality carpet flooring at the lowest possible prices. We leverage our worldwide buying power to negotiate the lowest prices and cut out the showroom embellishment to save you money. Our group of franchises is able to make large purchases directly from suppliers. The result is name-brand carpeting for a fraction of the cost. You can come to us for the lowest prices and we urge you to compare what we offer to other stores and see for yourself. 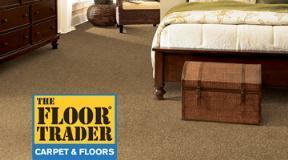 In addition, our carpet store carries exclusive brands only available at our locations. These options also include specific lines from recognizable companies like Resista flooring. We do everything in our buying power to give our customers the best prices for their home or office carpeting needs with carpets startings as low as $0.74 a sq. ft.
Make a decision that is environmentally friendly when you purchase new flooring from our store. Our sales experts can guide you to our renewable and eco-friendly materials, many of which are carpeting choices. More and more fibers are made out of recycled materials that are stylish, attractive, and durable. If you are purchasing for yourself or a client and want to make an environmentally responsible decision, we’ve got you covered. At our company, we connect you with professionals to properly handle your carpet installation service. Because of our prominent position in the industry, we are able to provide you with a list of preferred contractors in the area that have been vetted and proven to meet our high standards. This gives you a start in making a decision but allows you the freedom to get quotes from preferred installers. The contractors and installers on our list of preferred experts are professionals who are honest, courteous, and have a reputation for dependability. Let us do the legwork in eliminating unreliable or inexperienced installers so all you have to do is schedule the carpet installation. We are committed to helping you find exactly what you need. Our flooring specialists guide you through our selection system that divides carpet into different categories. They are sectioned off into Good, Better, Best, and Premium carpet flooring coverings so you find what you need to make your client’s flooring visions a reality. We are familiar with working alongside other industry professionals in finding the right options. In fact, our team keeps established clients in mind for future projects and more. Trust us to be your partner in pleasing your client base with new carpet flooring. Making a purchase that will transform your home is exciting. Add to the enthusiasm for your purchase when you can carry your new flooring home with you. Come to us in order to get the best prices available and to take home your purchase without waiting for an order to make its way to the store. Contact us today to learn more about carpet flooring options available from our store. We are convenient to clients in Cocoa, Port St. John, Titusville, Rockledge, and Merritt Island, FL.